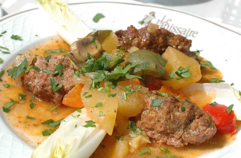 Le Janissaire, serving mostly French clientele for over 12 years, takes its name from the historic name of the guardsmen for the Ottoman Sultan. Decorated with pictures of the Ottoman Sultans, the restaurant with a simple yet elegant feel is organized into four intimate indoor sections, a bar and an attractive outdoor terrace. 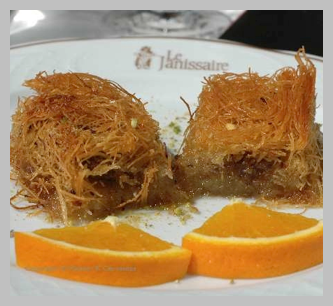 Chef Salih Kırımselioğlu has been the head chef at Le Janissaire for over 8 years, keeping the tastes consistent and the repeat customers coming. Daily menu (menu du jour), a three course prix-fix menu for 13 Euros, brings together interesting variations to classic mezzes, followed by a selection of daily main dishes and a choice of dessert. The standard a la carte menu offers many of the Turkish favorites like Hünkar Beğendi - among the most popular dishes according to staff-, shish kebab, Ali Nazik, seafood and other meat preparations along with a rich selection of cold and hot mezzes. Two standard menus, one for seafood selections and a menu degustation for a sampling of Turkish classics make picking from the extensive list a bit easier for those unfamiliar with the cuisine. Islim kebab or Tandir are listed among the specials of the house. Well, who knew!? In a city considered as one of the most important culinary centers of the world, two Turkish restaurants have made a name for themselves, and earned the distinction of being listed in the Michelin Guide of France, a guide well respected around the world for selecting the best restaurants and chefs. During my recent trip to Paris, I visited these restaurants, sampled from their menu and talked to their staff. It is encouraging to see our cuisine well represented outside of Turkey, and these restaurants reaching out to new communities, and educating them about the specialties and the variety Turkish cuisine has to offer. These exemplary entrepreneurs and chefs proud of our heritage, capture the essence of our cuisine as they execute it with internationally recognized quality and elegance. Congratulations to their owners, chefs and staff! During my visit, I tried Le Janissaire’s menu du jour, starting with an eggplant tarator, an appetizer of mashed eggplant with garlic yogurt, accompanied by the home baked mini-pita bread, followed by a meatball dish with vegetables in broth (sulu köfte - see right), that was satisfying both for the eye and for the soul. The kadayif, a delicate but decadent dessert made of shredded wheat and walnuts, and last but not least, the red comforting Turkish tea topped it all. Everything was delicious, original and all worth another trip next time I am in Paris! During my lunch, I noticed that a young apprentice was sitting at the bar. 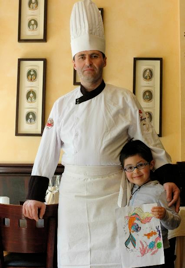 Matheo (Nuri), Chef Salih’s young son (see photo above) sampled from the menu for lunch. Thanks Matheo, for keeping an eye on things! “Le Janissaire-Yeniçeri” What is in the name? Yeniçeri, or in English, Janissary, was the name given to Sultan’s guardsmen or bodyguards in the Ottoman Palace. This group of specially selected and trained soldiers served the sultans of the palace between 14th and 18th centuries. At left, you will see an illustration of the janissary, from 1572.